Mt. Sneffels Press is proud to present our History Catalog for your ordering convenience. 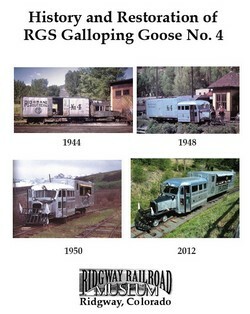 This book takes the reader through the entire restoration process of Galloping Goose No. 4, which ran on the rails of the famous Rio Grande Southern RR many years ago. It provides the history of GG 4 and the men who operated it, relating how an agreement was reached to begin restoration, describing the moving of the Goose from Telluride, CO, to Ridgway, CO, and a thorough explanation of the methods used to complete the restoration. The Goose was returned to its Telluride display space adjacent to the San Miguel County Courthouse on May 16, 2013. “A very complete and accurate account of the life and times of Galloping Goose No. 4 from its construction in 1932 to conversion to a tourist Goose in 1950, and its eventual restoration by a group of dedicated Ridgway historians and prolific author[s].” Mallory Hope Ferrell, noted railroad historian. Read the review of the book from Railfan & Railroad magazine by clicking here. Read the review of the book from the Narrow Gauge and Short Line Gazette by clicking here. ISBN 978-0-9800603-9-3, 101 pages, 8-1/2 x 11 inch softcover, numerous black and white historical photographs, $19.95 price + $3.50 shipping and handling. Shipping to USA only. (International not currently available due to high rates. If you wish international shipment, contact me using the form here and I’ll get a quote to you.) Read more about the Railroad Museum Authors. You don’t have to be a PayPal member to use PayPal. See here for more info. If you intend to purchase more than one book (for example both the Goose book and the Narrow Gauge book), be sure to use the shopping cart rather than the “buy now” button. Doing so will save you money on postage. Mary Ann Dismant's sweet reminiscences are a joy to read! 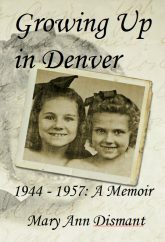 This memoir is an impression of Denver from 1944-1957 as experienced by two young sisters. The main purpose of this writing is to show joy, fun, humor, pathos, and provide a portrayal of Denver during a simple time in its history. Nancy Jo and I were uprooted from a happy home-life with our great Aunt Gertrude and Uncle Joe in Omaha. They were my Mom’s aunt and uncle. Now at ages four and five-and-a-half we were to begin life in Denver. Our parents, this city, all new to us, a blank page to be filled with – what ? Then there was the even greater mystery of living with two near strangers, Helen and Ernie Nelson, who seemed, in our view, to share nothing more with us than our common last name. We had only been with our parents a short time in our early years. Real little pessimists, weren’t we? We did learn to know and love our parents, with all their frailties. We also learned to know and love the myriad charms of Denver, at times resorting to furtive means in our explorations. Nothing in this memoir is fiction. All of these stories are true. Transitions! Both for us and for Denver, growing pains and all. ISBN 978-0-9800603-5-5, 65 pages, softcover, $7.95 price + $3.50 shipping and handling. Shipping to USA only. (International not currently available due to high rates. If you wish international shipment, contact me using the form here and I’ll get a quote to you.) Read more about Mary Ann Dismant You don’t have to be a PayPal member to use PayPal. See here for more info. Growing Up in Denver: Add to your shopping cart! Now available from Amazon directly! Order information from Mt. Sneffels Press: ISBN 978-0-9800603-7-9, 121 pages, softcover, $14.95 price + $3.50 shipping and handling. Shipping to USA only. (International not currently available due to high rates. If you wish international shipment, contact me using the form here and I’ll get a quote to you.). Read more about OCHS. You don’t have to be a PayPal member to use PayPal. See here for more info. 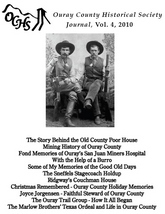 OCHS Journal Vol. 4—Go straight to checkout! OCHS Journal Vol. 4: Add to your shopping cart! “A number of improbable narrow gauge railways once operated in the incomparable mountains of Southwestern Colorado. The stories of these steel rails laid through granite mountains is the story of Colorado itself. Heroic effort and tremendous engineering opened the wealth of the San Juans to the outside world. 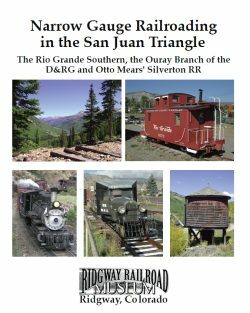 “Here in this volume are compiled some of the stories of those railroads that illuminate different aspects of narrow gauge railroading as it once was in the Silverton, Ouray and Ridgway area. A time of steel rails, iron men, wooden cars and granite mountains comes to life once again. Enjoy this peek into what was and what remains.” Charlie Getz, columnist, Narrow Gauge and Shortline Gazette. “The Ridgway Railroad Museum has assembled a wonderful selection of little known stories and facts about the narrow gauge railways of Ouray County. Talk about a group of dedicated individuals. The RRM has accomplished more, in a brief time, with fewer people and limited resources than many larger organizations.” Mallory Hope Ferrell, noted railroad historian. “There’s a saying at the Plaindealer newspaper office in Ouray. We never go wrong running articles on local history. So when the good folks from the Ridgway Railroad Museum offered up a series of well-researched, interesting and informative pieces about the role of the rails in county history, it was a no-brainer. They ran, readers soaked up the local lore and an important piece of Ouray County history was enriched and preserved. This book takes that achievement to the next level.” David Mullings, editor & publisher, Ouray Plaindealer. For a fascinating errata that connects railroading with ships, see here. ISBN 978-0-9800603-4-8, 110 pages, 8-1/2 x 11 inch softcover, numerous black and white historical photographs, $19.95 price + $3.50 shipping and handling. Shipping to USA only. (International not currently available due to high rates. If you wish international shipment, contact me using the form here and I’ll get a quote to you.) Read more about the Railroad Museum Authors. You don’t have to be a PayPal member to use PayPal. See here for more info. Railroad book: Go straight to checkout! Railroad book: Add to your shopping cart!